Does your health go on holidays when you do? Do you just let everything go the moment you hit the airport lounge and recline with a glass of your favourite tipple? We’d agree it’s undoubtedly the best way to mark the start of any long-awaited, well-deserved break. You want to eat and drink precisely what you want whenever you want. You don’t want to count calories, count steps, run a kilometre, or lift a single kilo during your down time. All you want to do is just relax, enjoy good food, and even better drinks. This is what holidays are about, what we work the whole year for after all. But what if there was another way to holiday? What if, instead of your health going on holidays when you do, all your bad habits do instead? All your, ‘cheat days’, your ten cups of coffees a day, your ‘I’m too tired for the gym today’, all your mid-week after-work drinks days go on a break and disappear for a couple of weeks, and instead everything that’s good for your body and soul come to the surface? Ask yourself this: when do you get the time to focus solely on what you eat, what goes into your body to fuel it, what exercises your body responds to the most? When do you get the chance to exercise every single day in different ways that works out your mind and soul as well as your body, and eat exquisitely nourishing food prepared by top chefs – all amidst a stunning vista and backdrop? When? When do you get the chance to just give your entire focus purely to your wellbeing? Are the stresses of the daily grind, the ever-changing technology, the shift in everyday trends sustainable for our overall wellbeing? The impact of such exponential change can often push us to our very limits as the speed of change continues to accelerate. Such development is going at a much faster rate than our bodies’ ability to adapt and we can only imagine what challenges will need to be met in the future. How will we address these? How prepared are we? A health holiday is not a foreign or new concept. In fact, health retreats have been around for a time, and there are hotels and resorts worldwide specialising in health holidays that may make you question if there really is any other way to ‘vacate’. Your holiday is hard-earned, it is well-deserved – why not spend it focussing on achieving the optimum you and prepare yourself to enjoy now and a long, happy future …. There are two major types of wellness resorts. The first is more like the large, luxury resorts we are most familiar with which have excellent and very comprehensive fitness and wellbeing programs integrated within the establishment, and the other is a retreat which dedicates itself purely to wellness and are often all-inclusive and have minimum stay dates for duration of stay. Flanked by the Andaman Sea and the dramatic limestones of Phang Nga Bay, it’s easy to slip into a world of seclusion and privacy at one of Phuket’s finest properties, COMO Point Yamu. Tucked away on the tip of Cape Yamu (east of Phuket Old Town), hilltop views and Italian interiors of contemporary luxury define the uniqueness of this hotel. Take the time to consolidate such beautiful surrounds at the COMO Shambhala Retreat and channel it all into your wellness. The Asian-inspired holistic indulgences are offered across two double and five single treatment rooms. 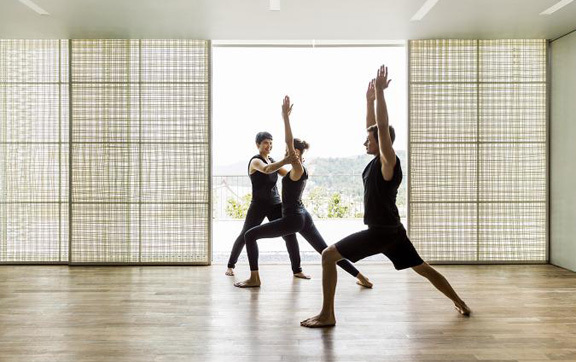 Enjoy yoga and Thai massages and the resort’s state-of-the-art gym facilities. The acclaimed La Sirena restaurant is hailed for its use of raw and organic ingredients whilst offering Italian favourites from pizza to seafood. The resort’s 79 rooms will ensure you dedicate your time to relaxation with most rooms boasting their own private terraces, floor-to-ceiling windows to savour the views of either the bay or the cape, and private pools. ‘Barefoot chic’ is often how this Maldives resort is described as there is rarely an occasion where footwear is necessary. And it is here you can play out all your fancies of a Robinson Crusoe-type getaway – far from anywhere but with the style of Giorgio Armani and the understated elegance that the COMO brand has come to be known for. Individual over-water villas resemble a collection of Keralan boathouses, and calming white interiors and teak flooring create a soothing, laid-back ambiance. The Shambhala Retreat’s focus is on holistic and Ayurvedic therapy. You can book in for a ‘wellness path’ course of treatments to be enjoyed in the spa suites, or in the privacy of your own room. The award-winning retreat at Cocoa Island by COMO fuses Asian-based therapies, nutrition, exercise, and yoga overseen by experts in holistic health. SHA Wellness Clinic is basically your one-stop-shop for anything to do with your wellbeing, including tailored programmes from weight loss and detox, to rejuvenation and sleep recovery. Perched atop a serene setting overlooking the Mediterranean Sea, SHA is a medical resort that combines ancient Eastern with revolutionary Western techniques including Ayurvedic therapies, Reiki, traditional Chinese medicine, and meditation. Located on a beautiful mountainside within the Sierra Helada Natural Park in Alicante (Spain), its vast grounds span six buildings covering more than 6,000 square metres of manicured gardens, numerous pools, 93 suites, 80 treatment cabins, Pilates studio, Technogym, medical rooms, and relaxation areas. In addition to medicine and therapies, the clinic offers cosmetic dentistry and Thermage with anti-ageing, energy health, and stem cell units dotted around the resort. You can also enjoy Aesthetic Medicine, which uses progressive non-evasive methods. The menus here naturally consist mostly of organic ingredients grown on its very own soil. When you think health and wellness, an exotic location set in tranquil greenery most likely comes to mind. The seven acres of lush, tropical gardens of Chiva-Som International Health Resort would be what you’ve been dreaming of. 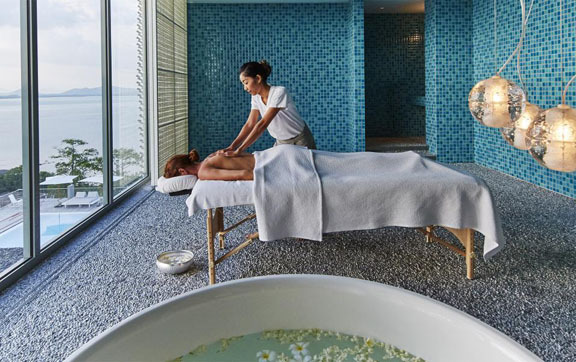 Set in the royal city of Hua Hin on the Gulf of Thailand, this multiple award-winning beachfront health resort marries modern, international standards with legendary Thai hospitality to present you with a customised, holistic wellness experience. The 54 luxurious accommodations include traditional Thai Pavilions, as well as Ocean Rooms and Suites, which all come with stunning views of the Gulf of Thailand. The resort boasts 70 treatment rooms, a kinesis studio, gym, watsu pool, flotation pool, large indoor and outdoor pool, bathing pavilion with kneipp bath, sauna, steam room, and jacuzzi. In addition to Yoga and Tai Chi classes, you can also channel your inner chef with cooking classes. But if you prefer to leave the cooking to the experts, then you can look forward to the resort’s Spa cuisine, which have won numerous accolades, and uses organically grown produce from the Chiva-Som gardens. Sitting on eight acres of lush foliage on the banks of the Paravur Lake in Venad, in a sleepy village at Kollam (India), Kalari Rasayana is an exclusive Ayurveda treatment centre with a hospital approach. Dotted with coconut groves and offering views of breath-taking sunsets creating silhouettes of local fisher men casting their daily nets, leave your cares far behind as you enter a world of peace, quiet, wellness and beauty in equal measure. Enjoy a complete Yogic experience with Yoga at daybreak, meditation and chanting, satsangs (evening assemblies) marked by traditional classical dance and music, the ancient Kalari practices, lakeside walks, and massages with medicated oils. At Kalari Rasayana, the food is uniquely part, and is the key element, of your therapy. It is the first step in detoxifying your body, is individually prescribed by your physician, and prepared on saatvic principles specially for you based on your constitution and treatments. Its 22 well-appointed suites and 11 Ayurveda treatment rooms will help you leave a lifestyle advocated by ancient Indian traditions, leaving you feeling energised, refreshed, and balanced. 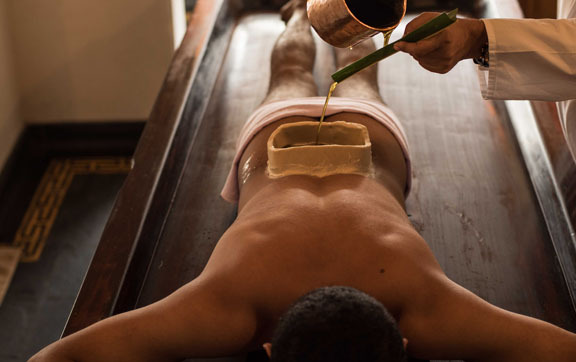 A former palace of the ancient Vengunad Kingdom in Kerala is the setting for this Ayurveda centre, where the system is followed in its most authentic form – no meat, wine, television, cell phones, or shoes. The paradise-like surrounds induce a tranquillity and calm that promises a refreshed body and mind through deep connection with the spirit. You wear traditional clothing, and eat organic meals which are custom-designed for you, paired with health drinks and herbal concoctions that vary with your treatment. Every therapy is personal here, in conference with the doctors, and combined with yoga and other methods to enable deep healing from the inside and out. Treatments include anti-ageing, weight reduction, detoxification, and stress management, and are based on your individual needs and body type. A typical day at Kalari Kovilakom begins with a wake-up call at sunrise, warm water to drink, meditation, yoga, and ayurvedic regimens. You enjoy all this amidst a mountainous backdrop in accommodation that is understated luxury punctuated in polished terracotta floors, heavy teak beds, and wooden shutters found in just 18 rooms. All the ingredients for your meals are harvested from the resort’s organic fruit and vegetable patches. If you’re seeking a once-in-a-lifetime experience of spiritual and holistic immersion, then head to the foothills of the Himalayas. It is here you will discover, close to the holy city of Rishikesh and affording incredible views of the Ganges River, the award-winning luxury destination spa resort that is Ananda. Integrating traditional Ayurveda, yoga, and Vedanta with international wellness experiences, fitness and healthy organic cuisine, at Ananda you will restore your peace and inner balance as well as harmonise your energies. Set in palatial grounds on a 100-acre Maharaja’s Palace Estate in Uttarakhand, you can expect royalty treatment as the attentive, nurturing staff bow, seemingly floating pass in fine white pyjamas and perform prayers as they wash your feet ahead of each spa experience. 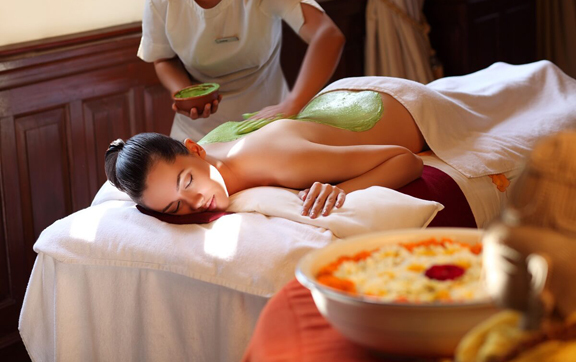 Choose from a comprehensive array of treatments offered in fastidiously comfortable private rooms that come complete with picture-perfect views of either the Maharaja’s Palace or Ganges Valley. Hear from excellent visiting speakers teaching non-materialistic Indian spiritual concepts, and dine on cuisine prepared from fresh, natural produce that incorporates the key ayurvedic principles to revitalise your body. In such surrounds, you can’t pass up a walk or trek that offers unparalleled Himalayan views or, for the more audacious, why not try your hand at taming the rapids of the Ganges on a white-water rafting adventure! Comments About World’s Best Health Resorts: Holiday for a New and Improved Healthier You! 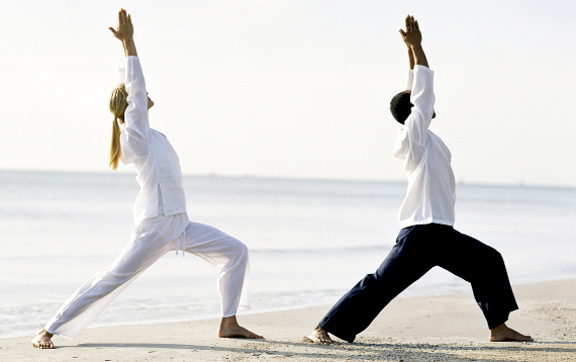 You're commenting: World’s Best Health Resorts: Holiday for a New and Improved Healthier You!